To the beat of drums and Bhangra dancers, Amitabh welcomed Krishnaraj and Vrinda Rai, parents of Aishwariya, at the gates of his house in suburban Juhu yesterday. Industrialist Anil Ambani, attired in kurta and pyjama, accompanied the superstar in welcoming the Rais. Donning a white crystal-studded kurta, Amitabh smiled and chatted with the Rais as he folded his hands in a traditional welcome. A scuffle broke out between the gathered media and the security personnel as shutterbugs tried to get their best shots. Several celebrities from the world of films and politics attended the Sangeet ceremony. The groom arrived at around 9.30 pm with sister Shweta Nanda and her daughter Navya in a white limousine. Other guests included actors Ajay Devgan and his wife Kajol, Director Karan Johar with his mother Hiroo, Director Ram Gopal Varma, Sarod players Amaan Ali and Ayaan Ali, sons of Sarod maestro Amjad Ali Khan. Shiv Sena executive president Uddhav Thackeray's wife Rashmi also put in an appearance as did model-actor Bikram Saluja with his wife Schauna Chauhan. Others seen at Pratiksha included Amitabh's brother Ajitabh with his family as well as Samajwadi Party leader Amar Singh and Sahara head honcho Subrata Roy. Abhishek is the son of Bollywood legend Amitabh Bachchan and popular 1970s actress Jaya. The preparations are in full swing at the Bachchan's bungalow, Pratiksha, where the main function will be held. A temporary wooden structure is being built around the house to ensure that no prying eyes or cameras ruin the private moment for the family. In addition, up to 400 security guards will be on duty to keep strangers out, says Capt Swarn Salaria, the head of Trig Force Guard Limited. "It is going to be a very high profile marriage, various dignitaries like very big personalities from the film as well as political world will be there, family friends will also be participating in the marriage, for which we have made all the arrangements to ensure that the flow of people coming in and going out is not disturbed," Capt Salaria told the BBC. The Bachchans have also reportedly requested neighbours with views over their bungalow not to allow any cameras or press into their homes. Despite the secrecy, some details about the preparations are filtering out. Aishwarya Rai's outfits, including the main wedding dress, are being designed by Indian fashion designer Neeta Lulla. The bride's jewellery has been bought especially from Calcutta and special silk saris from the northern town of Varanasi have also been ordered. Four-page invitations, embossed with two As, the couple's initials, have been signed by them as well as the entire Bachchan family. Businessman Anil Ambani, his wife Tina, politician Amar Singh and Uttar Pradesh state chief minister Mulayam Singh Yadav have been invited. There are reports that the leader of Maharashtra state's powerful regional Shiv Sena party, Bal Thackeray, has also been invited and will attend. Other invitees include close friends from the film industry, such as director Ramesh Sippy and son Rohan, director Yash Chopra and family, director Karan Johar, actors Ajay Devgan and wife Kajol, actor Sanjay Dutt and directors Goldie Behl and Apoorva Lakhia. From Aishwarya Rai's side, her parents and brother along with his wife are expected to be present. According to a friend of the family, the Bachchans want the wedding to be low-profile because the groom's grandmother is very unwell. However, Hindu traditions are being observed and the festivities will begin on Wednesday with the sangeet (music evening) at the Bachchan residence. Thursday will be the henna night - when henna is applied to the bride's hands. That will reportedly be held at Ms Rai's residence in Bandra, with the henna being brought in from Rajasthan. Mrs Bachchan recently told an interviewer that she had always loved Aishwarya Rai. When asked if she though Ms Rai would make the perfect Mrs Abhishek Bachchan, she replied, "I think so". Abhishek Bachchan and Aishwarya Rai got engaged in January. The two have appeared in a number of films together, but only one, Guru, has been a box office hit. No Bollywood bigwigs like Shah Rukh Khan and Hrithik Roshan have been invited for the wedding, which will be a small family affair. There will be no honeymoon for the couple as Amitabh Bachchan’s mother and Abhishek’s grandmother, Teji Bachchan is not well. But there is hearsay of a lavish reception because cutting off the film industry from the celebrations is not really an option. The rights for covering the wedding have reportedly been sold to an international media house. News of the Ash-Abhishek romance started making rounds last year while the couple were shooting for Umrao Jaan and Guru. Aishwarya and Abhishek finally got engaged on January 14 this year soon after they returned from the premiere of their film Guru in Toronto and New York. After her engagement with Abhishek, the actress made her first public appearance with the Bachchans to the sleepy town of Mirzapur in UP to celebrate Amitabh Bachchan’s close friend, Amar Singh’s birthday on January 28. The Bachchans are considered to be close to the erstwhile royal family of Jaipur and chances are that the bash would be held here and be attended by over 6,000 guests, including Bollywood stars, industrialists and politicians. Sources in the Jaipur City Palace said the Bachchans have expressed a desire to book the entire palace for a day. Their major concern, however, is the security of the high-profile guests coming to attend the party. The Bachchans' representatives are also reportedly in talks with some five-star hotels on the Jaipur-Delhi highway for the accommodation of some guests. Speculation about the Jaipur do were fuelled after the former queen of Jaipur Padmini Devi met Jaya Bachchan in Kuchaman where she, along with Abhishek, is shooting for Goldie Behl's film "Drona". The Jaipur City Palace is an imposing blend of traditional Rajasthan and Mughal architecture. The vast complex was originally built by Maharaja Jai Singh II of the Kachhwaha clan of Rajputs in the early 18th century. The complex is divided into a series of courtyards, sprawling gardens and buildings. It is home to several palatial structures like the Chandra Mahal, Mubarak Mahal, Badal Mahal, Govind Dev ji Temple and the City Palace Museum. Rumours are also rife that Udaipur, known as the city of lakes, could be chosen to host the post-wedding celebrations. According to sources, the Udaipur City Palace complex could be the party venue. Part of the palace has been converted into two hotels and another part still serves as the residence of Udaipur's erstwhile king. But it offers plenty of spots to hold a grand wedding and can accommodate 100-3,000 guests at a time. The most popular of them is the landscaped promenade on the shores of Lake Pichola It offers spectacular views of the lake, island palaces and mountains. The Promenade Jetty is another venue for special dinners and ceremonial occasions that can accommodate up to 2,000 guests. The island palace of Jagmandir is one of the most exquisite venues for weddings. Jagmandir's garden courtyard can accommodate up to 500 guests. Udaipur has played host to many big weddings, including actress Raveena Tandon's marriage to businessman Anil Thadani in 2004. Actor Vikram Chatwal, son of US-based hotelier Sant Chatwal, also held his pre-wedding parties here in 2006. Abhishek Bachchan and Aishwarya Rai, finally did touch down in Times Square Friday night, as their Bollywood film called “Guru” opened around the world. The US premiere took place at the vast AMC Empire 25 theater on West 42nd Street. Aishwarya Rai has acted in Hindi, Tamil, Telugu, Bengali and English films. She is currently regarded as one of the biggest names in Bollywood. In 2003, Rai was a member of the jury at Cannes. 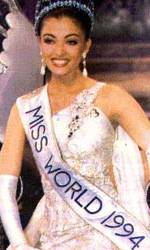 In 2004, she was chosen by TIME Magazine's Asian Edition as one of Asia's "100 Most Influential People." She was the subject of a 60 Minutes profile on January 2, 2005 - "The Most Beautiful Face in the World." A month later she appeared on the Late Show with David Letterman, and on April 25, 2005, she was featured on Oprah's "Women Across the Globe" segment. A wax figure of Rai is on display in London's Madame Tussaud's wax museum.